Training with focus mitts is arguably one of the best ways to develop your fighting strategy, reflexes, punching, and defense technique. It’s not just a great workout, but also incredibly fun and intellectually stimulating. Furthermore, it’s the closest you can get to realistic fighting aside from sparring. That being said, focus mitts are an incredibly versatile piece of boxing equipment, yet many boxers are only focusing on hitting them as hard as possible when they should also be focusing on accuracy, timing, rhythm, strategy, style and more. There are many different ways you can improve yourself on the mitts, so it’s important you don’t focus on one thing only, as that’s a way to cheat yourself out of improving the more slick and refined “sweet boxing” abilities. Here are some tips for hitting focus mitts. Your punches should come with a rhythm, and they should have a natural flow. It’s not a race, so you shouldn’t focus on landing as many punches as you can, as fast as you can. Instead, focus on your breathing and endurance. If you’re winded up just after a couple of minutes, then you’re probably focusing more on power than rhythm. Focus on timing as well, because timing is actually what ensures you do as much damage as possible. 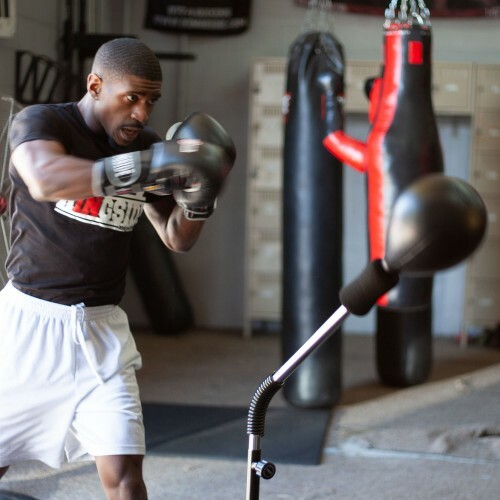 Focus mittens are probably the best boxing equipment for helping you improve your rhythm, which is why every professional boxer does extensive workouts with them. It doesn’t matter how powerful or fast your punches are if you don’t land them. Take a little off the power and speed if it means you’ll improve your control and accuracy. Don’t swing wildly at the mitts and force the padman to catch all of your punches. Aim and focus on technique by ensuring your elbows and all other joints are in place so that you’re landing punches with proper support on your wrist. This also minimizes the chances of you getting injured in the process. I may have undermined the importance of power in the aforementioned points, but it still matters. However, it comes after accuracy and rhythm for a reason. While you can improve your power using mittens, they’re usually not the ideal boxing equipment to do so. You can go hit the heavy bag for power, but mittens allow you to practice timing and accuracy, which equals maximum power in a real scenario.